From its earliest days as a four-week Bible institute until now, Eastern Mennonite has maintained focus on its religious purpose. It evolved through a two-year Bachelor of Theology program from the 1930s through the 1950s, to a four-year theology degree in the 1960s, moving step by step toward having a full-fledged seminary. Yet facilities lagged. A so-called temporary wooden structure obtained from the Civilian Conservation Corps after World War II kept a roof but not much more over multiple generations of seminary students. As enrollment expanded, two more “temporary” seminary structures were plopped beside the first. 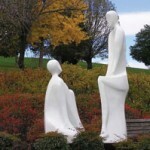 “Love Essence,” sculpted by Esther K. Augsburger, stands near the seminary. “No more waiting,” decided Joseph A. Lapp, who became EMC’s seventh president in 1987. One of his highest priorities was to consolidate the seminary in a properly handicapped-accessible building, complete with a chapel and prayer room, in addition to the usual offices, classrooms, lecture halls, and refreshment area. Fundraising for a $4.5 million seminary began in 1990. When ground was broken in 1992, $3.27 million had been committed in cash, pledges and deferred gifts. Another $1.2 million remained to be raised, including $450,000 for an endowment fund. At a point when fundraising seemed stymied on a plateau short of the amount needed to finish the building seminary students jumped into the effort, launching a “mustard seed campaign” and asking individuals to pledge $1,500 each. By the fall of 1993 when the seminary opened, all funds were in hand or committed, with the bulk coming from individual donors and their estates. About $500,000 came from foundations. With a total contribution of $637,000, Richard E. Martin from the class of 1933 was the decisive donor. The seminary’s “Martin Chapel,” with its adjacent fellowship hall (financed by Levi and Lillis Troyer), has become the location of choice for worship services, study sessions, and dinners attended by groups that number in the dozens rather than the hundreds. The area is highly adaptable, with moveable chairs and folding panels between the chapel and fellowship hall. It houses an organ and a grand piano, but also offers plenty of electrical sockets on a small stage to those who prefer sacred music produced by (say) electric keyboards and guitars. During the day, soft natural light filters into the chapel through a stunningly beautiful arrangement formed by glass panes in shades of bluish-green, appropriately named “Where the Soul Never Dies” (given by Richard Martin in honor of his wife, Edith). Eastern Mennonite has undertaken a dozen major construction projects over the last 90 years or an average of one every 7 years but the biggest by far was the last, Phase I of the University Commons, completed in August 2000. EMU’s newest building, the 7-year-old University Commons. Costing a total of $11 million, Phase I started with dismantling an aging and inefficient power plant. “We cut our natural gas usage by 50 percent when we replaced the power plant, while adding 20 percent to our gross square footage,” says Kurtz. Phase I also ushered in an intercollegiate-quality gym for athletic training, competition, and viewing. Along with the modern space for sports, “commons areas” were created for a snack shop, bookstore, lounge, game room, student-life offices, and conferences. At the time critics of the project argued that the university was favoring sports over academics and that it was too expensive. At times in the discussion, the Eastern Mennonite community seemed to be polarizing between the “jocks” and the “nerds,” with both groups feeling misunderstood. Today, seven years past the opening of the Commons, few look back anymore. The complex is heavily used, year around. During summer months, it is packed with young people in junior- and high-school sports camps, offering much appreciated rental revenue to EMU. During the school year, it is used for intramurals, intercollegiate volleyball and basketball, indoor soccer, and batting practice for ballplayers on inclement days. At the north end of the no-longer-new gym, aspiring rock climbers frequently scale the artificial cliff. A floor above them, the fitness and weight-training rooms usually are in use by an interesting mixture of students, employees, and community members both genders, all ages, every size and shape. The indoor track in front of the fitness area is likely to have “senior citizens” taking walks on the outer lane while runners hug the inside lanes. The board of trustees has shifted its quarterly deliberations from the boardroom by the president’s suite in the Campus Center to the more spacious double conference room known as UC 211/212 in the Commons. 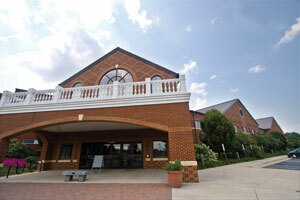 The Summer Peacebuilding Institute uses that same space in the Commons for six weeks each May and June. It is one of the most popular double-sized classrooms on campus, with its up-to-date climate control, access to audio-visual technology, and hospitable lighting. Large community gatherings the inauguration ceremony for our eighth president, Loren Swartzendruber, for instance, or the annual donor appreciation banquet are held in the Commons gym area after spreading a protective cover over its varnished-wood floor. The cafe-style tables in the Commons snack shop almost always have people clustered around them. In short, the University Commons is put to work year-around for all kinds of people and situations. 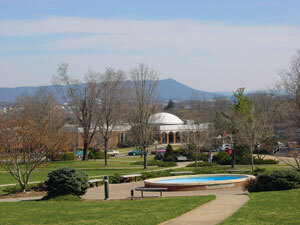 The structure seems to be a success in every way but these: donations to the project were not sufficient to (1) cover the necessary endowment for maintenance, nor to (2) permit undertaking Phase II of the Commons, which involved upgrading the attached 1957 gym and student center into a modern theater for about $9 million in 1999 dollars. Could EMU have survived without building the University Commons? Perhaps. But perhaps also it would have slid into obscurity in the collegiate world; the kind of slide that has happened to outdoor movie theaters and to Mom-and-Pop stores in the wake of a Wal-Mart opening nearby. In every major building in Eastern Mennonite’s history, some of the contributions were not visible to outsiders the amounts appeared on no published lists but they helped Eastern Mennonite to have high-caliber buildings at less cost per square foot than normally expected. These were contributions in consulting, workmanship and labor, usually provided by the Mennonite community or alumni. Let’s take the University Commons as an example. Carl Harman, the president of the firm that built the Commons, belongs to the class of ’67. His mother, Frances Harman, graduated in the college class of ’34. His father, Frank, graduated from Eastern Mennonite high school in 1930 and served two separate terms as a college trustee. Carl followed his father onto the board (but was no longer on the board when his firm built the Commons). Third-generation Harmans attended Eastern Mennonite. 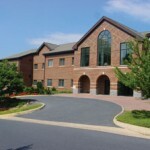 The family donated an entire building in 1974 (the Discipleship Center), and Frances was the single largest giver to the Campus Center, built by the Nielsen Company. The Harman project manager, Wayne Witmer, is an ’88 graduate, as are many of the firm’s employees and subcontractors. The cost of the Commons was $82 per square foot when it was finished in 2000. By comparison, the cost of University Recreation Center at James Madison University, a similar fitness-gym complex not far from EMU, was $107 per square foot when it opened in 1996. If we translate the cost of the two complexes into today’s dollars, the cost of EMU’s recreation center per square foot would be $99.22 in 2007 and the cost of JMU’s recreation center would be $142.09 in 2007. It’s a 30 percent difference. Sam F. Jones, the Troyer Group architect who oversaw the Commons, confirms Carl Harman’s observations. “EMU always surprises me with the quality of construction it gets for the dollars it spends,” says Jones. The actual costs for EMU’s three Troyer-designed buildings have come in 15 to 20 percent below market value, based on national benchmarks for construction costs in comparable communities. Witmer credits his alma mater’s “cooperative team approach” for holding down costs. “EMU has led by example in this area, reaping the benefits of its integrity, good will and fairness,” he says. 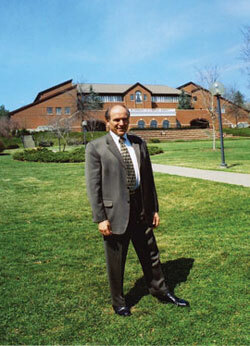 LeRoy Troyer in the winter of 2003-04 before the Campus Center, which he designed. EMU and the Troyer Group are committed to having builder input during the design stage. As a result, “EMU’s contractors come to the table excited about the process,” Witmer says. The process encourages the contractors to cooperate with each other together seeking the most cost-effective solutions for an institution whose mission and future matters to them rather than butting heads against each other. Kurtz says his experience echoes Witmer’s: “When I worked for the state, I saw firms that felt compelled to put in unrealistically low bids to win a contract. They then tried to make it up on change orders and by cutting corners here and there. Of course, everyone performs better if there is accountability, so Kurtz believes in conscientious oversight and doesn’t believe in “cost-plus” work on large projects. As long as a business proves itself to be a performer and worthy of being trusted, why not continue with it and benefit from the consistency and loyalty it offers? It is a 90-year-old dilemma for the college: nothing is more expensive than building or renovating facilities. Could the money be better spent on faculty salaries or financial aid? Yet those educational institutions unable to keep pace with the physical changes demanded by their times with the changed interests and desires of prospective students tend to close their doors sooner or later. As an example, our science professors still turn out pre-med majors who enjoy 85-100 percent acceptance rates to quality medical schools. Yet EMU has seen a marked decline in the number of pre-med students choosing to enroll here. If this trend continues, EMU will no longer be what it has been since the late 1940s: a source of a unique type of future doctor, one who is extremely well-prepared for medical school, but who also brings a “servant” ethos to his or her practice. The 40-year-old Suter Science Center must be reconfigured and upgraded to meet current standards for safety, ventilation and climate control for science labs. Ceilings need to be higher to accommodate the necessary new ductwork. Handicapped access must be upgraded (someone in a wheelchair must now roll outside and around the building to go from one floor to the next). Heating and cooling is no longer efficient and is costing us money we would rather spend on a facility that conserves energy. All of this points to building a new wing for our laboratories and renovating the old space to be classrooms and offices for other departments. In the absence of science center upgrading, EMU risks producing fewer and fewer graduates who become doctors. This would be a loss to humanity, because by and large, EMU’s grads practice medicine somewhat differently than the typical physician. They are more likely to share the priorities of cardiovascular surgeon Ingida Asfaw ’62 than, say, those of a Hollywood-style plastic surgeon. They are more likely to go where people are in desperate need of a competent, caring physician than they are to go where they could maximize their chances of making the most money. Today, in his fifth year as the eighth president of Eastern Mennonite, Swartzendruber knows he must do as his seven predecessors did. He must secure the money necessary to keep EMU current, while continuing to produce its uniquely prepared graduates. He’ll have help a talented vice-president for advancement, Kirk Shisler ’81, whom Swartzendruber recruited from a major non-profit based in upper New York state. He also has an enthusiastic board of trustees and a donor base that gives more with each passing year, especially through writing EMU into their wills. from a faculty-employee group of fewer than 10 to more than 350.
from a population of 40 students from several states to about 1,600 undergraduate, graduate and seminary students from across the United States and 36 countries. from less than a dozen courses (and those mainly on the high school level) to 892 courses in 37 college majors, four graduate programs and the seminary. from one old hotel building and a “tabernacle” on 30 acres to 50 buildings on almost 100 acres. from an alumni association of seven members in 1919 to more than 14,000 in the spring of this year. Politically and socially, EMU remains in its own unique “box,” different in significant ways from secular colleges, as well as from other Christian colleges that are not Mennonite. In a 2006 survey completed by 185 first-year students at EMU, 90 percent said that they go to church at least sometimes chapel is recommended but no longer required at EMU and 89 percent “affirm the significance of their relationship to God.” On the list of life goals, the majority of those surveyed at EMU listed “helping others who are in difficulty” above “becoming well off financially,” defying national student surveys that suggest the opposite set of priorities. 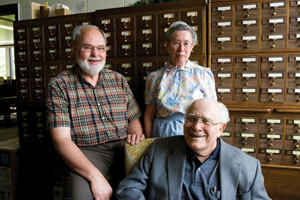 Three EMU history buffs who assisted with this series of 90th anniversary articles: Harold Huber, acting historical archivist at the Sadie Hartzler Library; Lois Bowman ’60, librarian at the Menno Simons Historical Library; and Hubert R. Pellman ’38, retired English professor and author of Eastern Mennonite College, 1917-1967. Eastern Mennonite and its students may look different than they did when Pellman was writing in 1967, but they still aspire to “the servant aspect of Christian life.” Buildings rise, fall or get renovated. Funds are raised and dispersed. Majors come and go. Clothing styles change. But one thing doesn’t change: the distinctiveness of EMU’s mission.